It has been a hell of a January, mostly for reasons I can’t really go into here. I was going to spend this week getting caught up on the stuff that fell behind while I was putting out fires in the first half of the month; but then Miles and I both got sick; and we decided at the last minute to do a Secret Wars episode, which meant reading about twenty issues very fast; and apparently there’s something in DayQuil that really messes with the way my eyes track, which is making everything involving text and images–which is to say, everything–take about twice as long as it normally would. *JUST KIDDING! I’m going to go research, write, and record a voiceover thing; then send about a dozen e-mails and finish reading Secret Wars II. Sick days are for people with real jobs! Week of January 28, 2015. 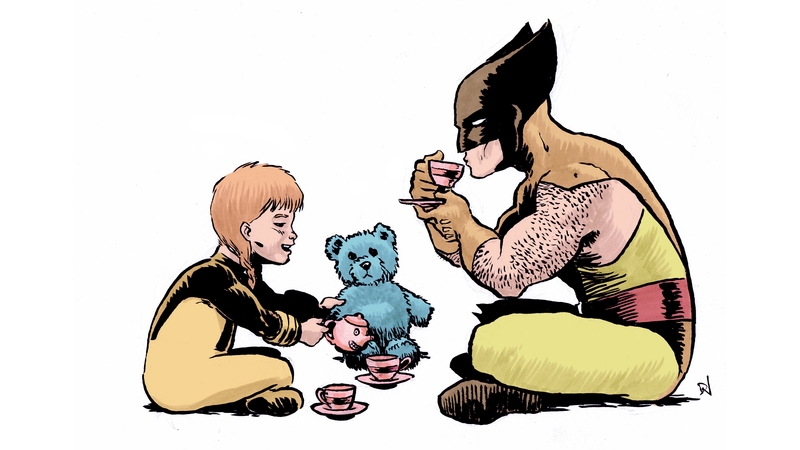 In which we carefully avoid spoiling Uncanny X-Men and remain disappointed by the lack of Wolverines heists; and Rachel mispronounces Bachalo but doesn’t realize until she’s already editing the video (oops). Art by David Wynne. Prints and cards available until 2/1/2015 in the shop, or contact David for the original. In which Nimrod is probably an honorary Summers by this point; Claremont hits a centennial; it’s probably pretty hard to get an unconscious person into tight leather pants; the X-Men finally encounter a world that actually hates and fears them; and the Power Pack fits somewhat uneasily with the grown-up Marvel Universe. 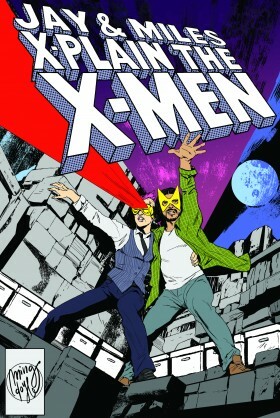 In which All-New X-Factor ends, Iceman is his own best foil, and Jordie Bellaire is a hell of a colorist. Totally unfamiliar with Shipp, but she looks like a baby Storm, and she’s not Halle Berry, so that’s two points in her favor. With the caveat that I’m no more familiar with this kid than I am with Shipp, can we take a moment to agree that the correct casting for teen Cyclops is and always will be Swing Kids-era Robert Sean Leonard? Welcome to Bayville, Rachel. Hope You Survive the Experience! 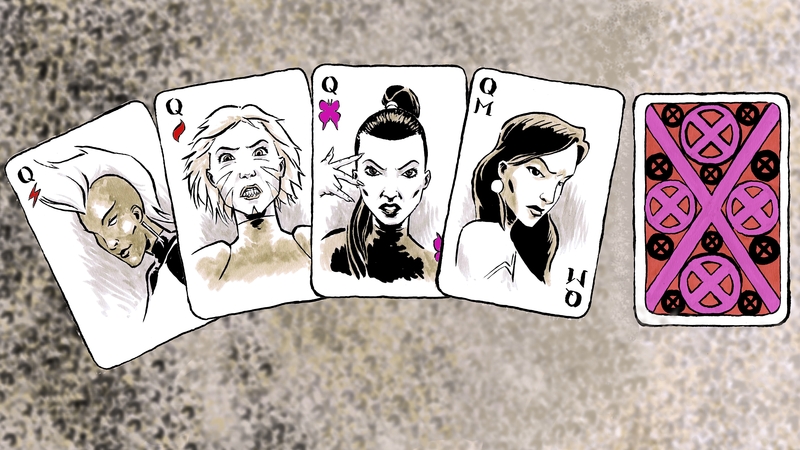 Coming soon to R&MXtX-M: X-Men: Evolution! Starting next week, I’ll be recapping and reviewing not one, not a dozen, but every single episode of animated high-school drama X-Men: Evolution. It’s no secret that I love this show. I love it a lot. I love the awkward teenagers (and even more awkward early animation); the dubious fashion; the high-school angst; the godawful Season One finale. I love the way it starts terrible and then slowly and subtly gets awesome while you’re not paying attention. I love that there’s an episode where it stops being a superhero show and instead spends 22 minutes doing a straight-up homage to old-school girl-gang movies. And I love seeing characters and premises I love reinvented and refiltered through very different sensibilities: what shifts and evolves, and what core themes persist through the changes. In a lot of ways, Evolution is the most daring adaptation of X-Men; certainly, it’s the one that moves furthest from any other incarnation of the series and team. Sometimes it succeeds brilliantly. Sometimes it fails spectacularly. But it never stops being fun. Art by David Wynne. Prints available until 1/25/2015 in the shop, or contact David for the original. The first issue of G. Willow Wilson’s Adler-Corbeau Award-winning run on X-Men, out this month! Are you reading Ms. Marvel? YOU SHOULD BE. It is superlative. G. Willow Wilson and Ming Doyle’s Nightcrawler story from Girl Comics #1. Miles’s favorite Rachel Summers costume, from Excalibur #64. Rachel’s favorite Rachel Summers costume, from Uncanny X-Men #207. Why has no one done a ballgown version of this yet? I mean: THAT NECKLINE! No, seriously: Why are you not already reading Ms. Marvel? It is the best. Next week: THIS DEFINITELY DOES NOT ACTUALLY HAPPEN. G. Willow Wilson. Go read everything she’s written. It’s all splendid. GO. NOW. You have until JANUARY 21 to send in your entries for the Corbeau Coloring Contest! If you want to help support the podcast–and see Rachel recap and review all 52 episodes of X-Men Evolution–now might be a good time to click over to our Patreon. In which writer G. Willow Wilson joins us to talk about her new run on X-Men; the Future is really confusing; we consider the many iterations of Rachel Grey; Storm probably has strong feelings about climate change; and writing for a shared universe takes some seriously fancy footwork. Next Week: Pink robots from the future! 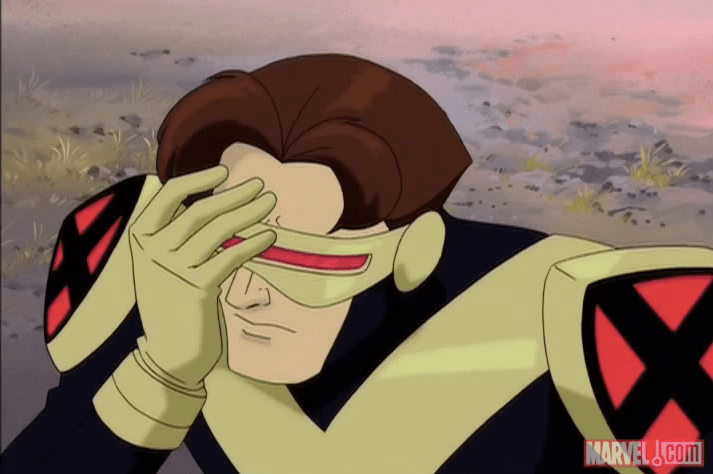 In which we continue to be frustrated by Cyclops, but everything else is pretty great.